Conventions are crowded. For medium to large furry conventions, imagine the crowds in a mall during an average busy saturday afternoon. For the extra large conventions, imagine a mall during the last shopping week of Christmas, during Black Friday, or the last time Tickle Me Elmo hit the shelves. Just combine all three when considering Dragon*Con or San Diego Comicon. This can be both a good and bad thing. It can lead to anxiety if you get nervous around crowds. But large crowds can also make it easier to blend in, reducing the obligation to be social and reducing anxiety of being singled out. If you have a difficult time with crowds, you may want to think about preparing yourself ahead of time. This is where going to smaller, local meets becomes useful; you can get used to being social around a larger group of people but also make some friends who may be also going to larger conventions. You can also try to expose yourself to larger crowds over time by going to places with bigger crowds for longer periods. While you’re at the convention, don’t be afraid to go back to your hotel room or find a corner if you need some alone time. But for severe social anxiety it’s recommended to speak to a therapist for professional advice. Remember the mall reference before? 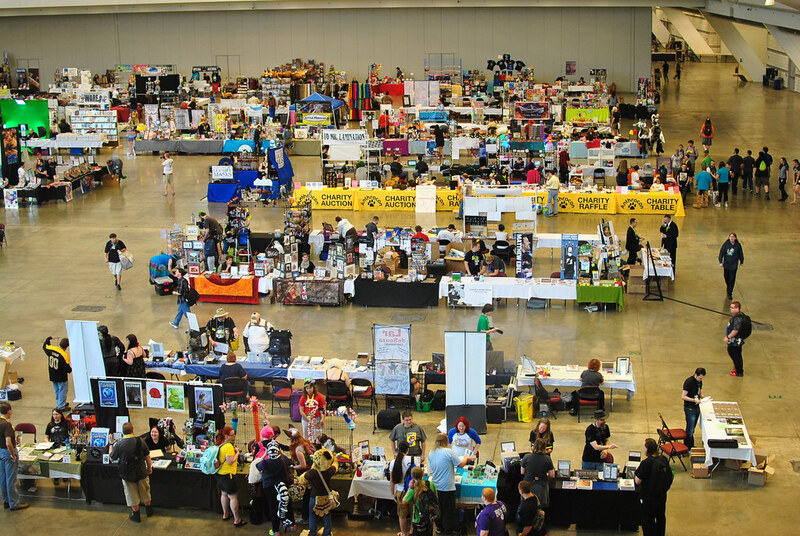 Medium to large conventions can have a similar level of noise to an average mall. Between people talking to friends, the antics of fursuiters and people playing music, it can be difficult just trying to hear the person next to you. Much like crowds, one of the best way to deal with the noise is to acclimate yourself to it. Going to noisy, active places and getting used to the sounds will help you grow accustomed to the noise of a convention. You can also try things such as earplugs, or even wearing earbuds and listening to your own music. But be warned, this can sometimes come across as anti-social. Furries at conventions can be very affectionate, and this can be startling if you’re not expecting it. Hugs are traded like they’re going out of style, and it’s not unusual to see people holding hands or showing other forms of platonic and not-so-platonic affection. There is also a significant number of people belonging to the LGBTQ community at furry conventions, so expect to see guys kissing guys and girls kissing girls. But I’ve never seen anything beyond that and it’s unlikely that you will either. Convention areas are still public places and public decency laws for the state apply. Many conventions have additional rules against adult behavior or accessories in convention areas, especially where minors could be present. Furry conventions are no different, and sometimes can have more strict rules in place. Most people who go to conventions are adults, so it’s pretty likely that there’s going to be drinking going on. Some conventions will even make alcoholic drinks available to sponsors. For others there will likely be bars nearby or people will bring their own drinks. Room parties are common and it’s a good chance that there will be alcohol at them. If you decide to drink, try to be aware of your limits and drink responsibly. It can be easy to go overboard and do something that you’ll regret the next day. This can also affect your convention experience in a bad way, and the last thing you want is to end up a part of the horror stories that con chairmen tell. You may want to consider having a designated sober person around to make sure that people get to their rooms and so someone can answer the door when con security comes by to check on the noise. You should also avoid drinking if you are under the legal drinking age– not just because your tolerance is lower, but because you can get your adult friends in a lot of trouble with the law. Finally, do you really want to be wandering around among a thousand strangers when your judgement is impaired by alcohol? Consider your safety at all times. There is a common misconception, at least at some furry conventions, that drinking is necessary for a good time. But it’s not. If you’re not comfortable with it, there’s no obligation for you to drink at all. Although there may be a lot of pressure to drink, no one will think less of anyone who decides not to. There’s also bonuses to being dry, such as ending up with a lot of interesting pictures and stories that no one else can remember. These are just a few things that I didn’t expect to find at conventions, but discovered quickly along the way. Is there anything else you may have heard of and want to know more about? Or if you’re a long time convention goer, what are some other points that new attendees should expect? Leave them down in the comments below! And come back next week when we tackle suggestions on how to pack for a convention!